1965 BSA Chopper for Sale is a 1968 BSA Firebird 650 motor on astretched and lowered 1965 BSA motorcycle frame that has girder front end. It has good tires, cranks up easily and rides great unlike a lot of custom bikes. I have a clean and clear title for it in my name. 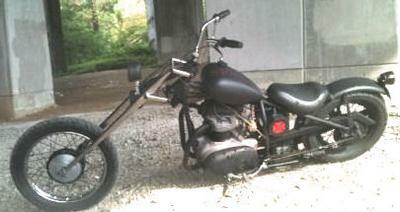 I might be willing to make a trade for an old Harley Sportster or any other bikes so shoot me a text if you have one. If you are aware of any problems that are known to be associated with the 1968 BSA Firebird engine used in the build or if you simply would like to voice your opinion or write a review you are more than welcome to do so using the space below that has been provided by Strike Lightning's Gogocycles Used Motorcycles for Sale (and PLEASE do not neglect to include your contact information in your email or to provide a phone number or email address!) so that I can respond with answers to your questions or so that our visitors can respond to your remarks or voice their own opinions if they would like. In my opinion there is not a better deal on a custom chopper for sale as nice as this BSA in Lexington Kentucky KY, on Craigslist or in an Ebay auction so hurry and make an offer before this beauty gets away from you! Strike Lightning's GoGocycles appreciates your interest in the 1965 BSA Chopper for Sale as well your making comments or sharing any information that you have on it to make the biker community aware of any problems that are commonly associated with these bikes or to highlight its positive features and help potential buyers make informed decisions. My asking price is a very cheap $4500 which is a very good price for a custom chopper of this quality so call me or text me at 931-436-3348 before it's gone and don't forget to mention that you found this ad on Strike Lightning's Motorcycle Classifieds www.gogocycles.com using the comments forms located on this page.